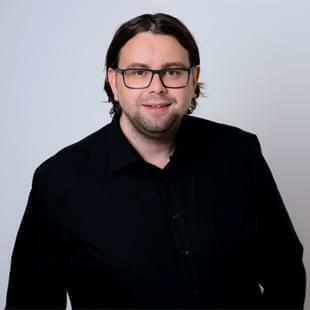 Tom Becker-Schweitzer, Managing Director of PresentationLoad GmbH, provides you with valuable tips and methodologies for creating your company presentation. Read on to find out how to design an effective company presentation and how comprehensive it should be. Your company presentation is a vital management and sales tool, presenting your company to new customers, potential partners, and investors. You know how important the first impression is, but what does an optimal company presentation look like? The answer: Your presentation should be as unique as your company, your products, and your services. There is no ideal or standard solution. But there are a few principles and rules you can follow. 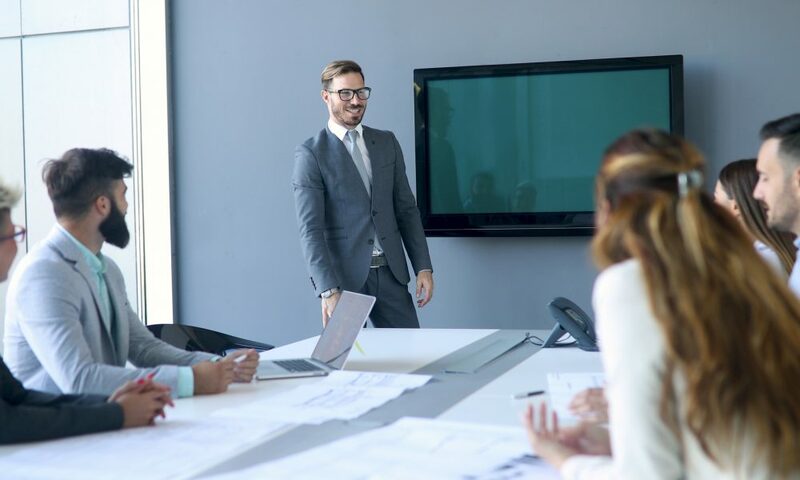 These four tips will make your company presentations more powerful and convincing. Your audience’s time is precious! A company presentation is often the starting point for discussions with existing and new customers, as well as important stakeholders. Keep in mind that managers and executives have less and less time and that attention spans can be very low. So, keep your company presentation short. 20 minutes to a maximum of 25 minutes is ideal for the informative portion (“about us” presentation). Then get straight to the heart of the matter and present your concept, a specific offer, or your products or services. Even better: End your presentation and start a dialogue. Studies have shown that attention rapidly decreases after just 15 minutes. Your customer will be grateful that you respect his or her time. In most cases, they are already better informed about your company than you realize. ✔TIP: Ask your customers what information they are really interested in before starting your presentation. Are they already familiar with your company? Have they visited your website? Knowing this will allow you to remove a large number of slides from your company presentation. Your company presentation should highlight the advantages for your customers. Your customers will first and foremost ask themselves this question: What’s in it for me? Put yourself in your audience’s shoes before creating the first slide of your PowerPoint presentation. What information is relevant to your customer? What are his/her motives (purchasing decisions/collaboration)? What does he/she know about your company? Which questions are likely to come up? Which key messages do you want to convey in your presentation? What is your USP and what makes you different from your competitors? What is the best layout and design for your presentation? Storytelling: How can we best convey our ideas? Answering the above questions allows you to create the most appropriate slides and content. Is your customer really interested in your company history? Or are they more interested in the innovative solutions you’ll soon be launching that deliver added value for your customers? Is it important how many locations and employees you have, or are they more interested in your customer service process? There is a lot of conceptual work to be done here. Brainstorming with team members, or workshopping with important decision makers from Management, Marketing and Sales can be effective. You can also consider working with a concept developer or specialized agency. ✔TIP: If you want to present for 20 minutes and spend an average of 2 minutes per slide, then your company presentation can only consist of 10 slides (approx. 12 slides with the title and concluding slides). You can always add another 20 slides as an attachment. This puts the pertinent information at your fingertips should any other questions arise. A company presentation consists on average of about 30-40 PowerPoint slides. However, only present the slides that are of real relevance to your customer and fit into your timeframe. Present interactively and not from A-Z. PowerPoint presentations have been used by companies for almost 25 years. Have you ever thought that the principle of linear presentation is perhaps outdated? Many managers still present their slides from A to Z regardless of time, the audience, or short attention spans. It’s easy to create interactive presentations with hyperlinks so you can move through your slides at any time without following a strict order. ✔TIP: Use your agenda slide to navigate interactively. Add hyperlinks to your agenda items so that you can jump to a specific part of your presentation at any time. You can also place a link on your logo, which allows you to jump back to this page. It’s so easy to create an interactive PowerPoint presentation! If you notice that you’re running out of time or your customer is interested in a particular topic, simply change the course of your company presentation by clicking on the corresponding chapters. Include your customer in your presentation by asking him/her what they are interested in and let them decide the course of the presentation if necessary. Text, images, and graphics: The 50/50 rule. It’s not just the content that counts. Most presentations we see from customers consist of 70-80% written content. However, many have already realized that bullet points and long text passages are not enough to create a convincing company presentation. This is where design comes into play. It’s not about writing everything out on your slides, but rather creating a presentation that supports you or the speaker in your presentation, both visually and in terms of content. Here’s a good rule of thumb: 50% of your slide should consist of text. The other 50% should consist of images, graphics, or diagrams. Of course, you don’t have to follow this rule with every slide but if you add more visual content, your PowerPoint presentations will be better received by your customers. The most important thing – keep it short. Keywords and short sentences are often enough. The following slides (screenshots from our Company Presentation toolbox) are good examples of design and layout. ✔TIP: Use more images and graphics in your presentations. After all, a professional and visually appealing presentation makes a greater impact than just pure written content. If you don’t have the time or you don’t feel you have an eye for design, use our PowerPoint templates. Or let a graphic designer or a professional PowerPoint presentation agency like PresentationLoad support you. Would you like to find out more or improve your company presentations? Just write a comment or contact me directly at becker@presentationload.de. I will be happy to answer your questions or, if you wish, work with my team to support you in the design, structure, and content of your company presentations. Sometimes it’s good to have someone from the outside look at your presentations from a different angle. 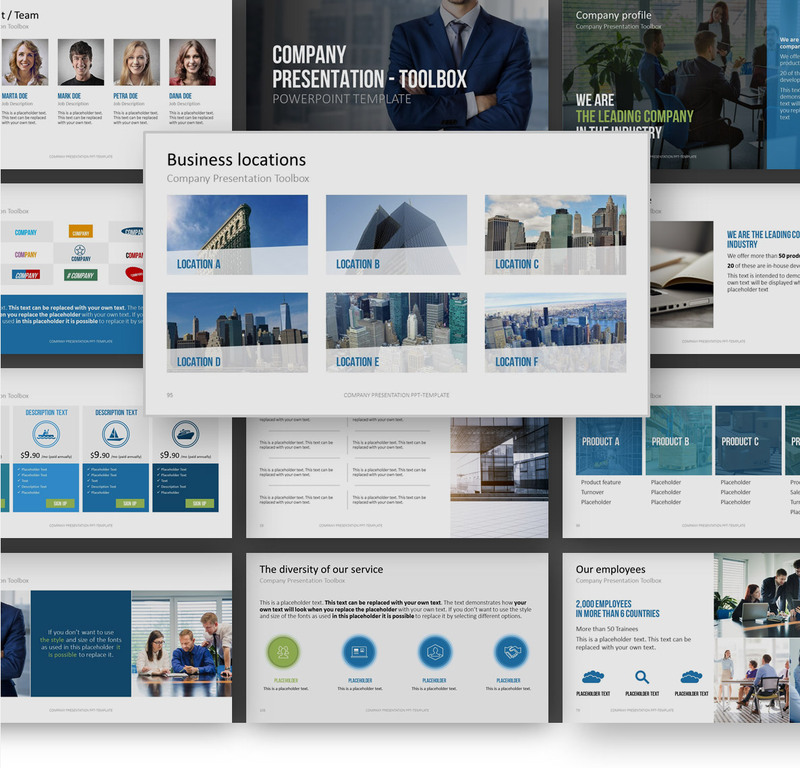 We have been creating PowerPoint presentations for mid-sized companies and international corporations for almost 20 years and have gained a wealth of experience with company presentations, sales presentations, and strategy presentations.